I'm thinking about doing a thing. It's a bad thing. It's THE bad thing. Week 1: Start with 3 Amonkhet boosters. Build a 30-card deck, making sure to include 12–13 lands. 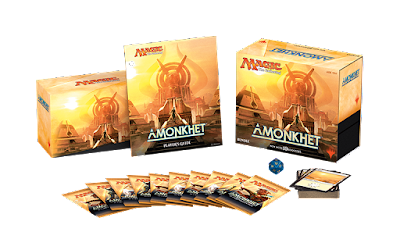 Weeks 2–4: You may add 1 additional booster from Amonkhet. Bonus: If your deck receives a third loss, you may add cards from 1 additional booster. My plan is to pick up a handful of boosters tomorrow and see what happens. I might just get the above pictured "Amonkhet Bundle". It has a Player's Guide, which I'll totally need for the rules as well as 10 boosters of the most recent set, 20 "fancy" basic lands, 60 normal basic lands, a spin down life counter, a storage box and 1 of each token creature in the set. It's enough to keep me playing for about two months using the one booster per week rule.